The construction sector has the lowest productivity gains of any industry according to international management consultants McKinsey. A recent report by the consulting firm on construction’s digital future indicated R&D spending in construction lagged well behind that of other industries. Australian company Fastbrick Robotics has pioneered a robotic technology that vastly improves the speed, accuracy, cost and waste management of the brick construction industry. The Hadrian X claims to be able to complete the brickwork on a home within 1-3 days, laying 1000+ standard bricks per hour. 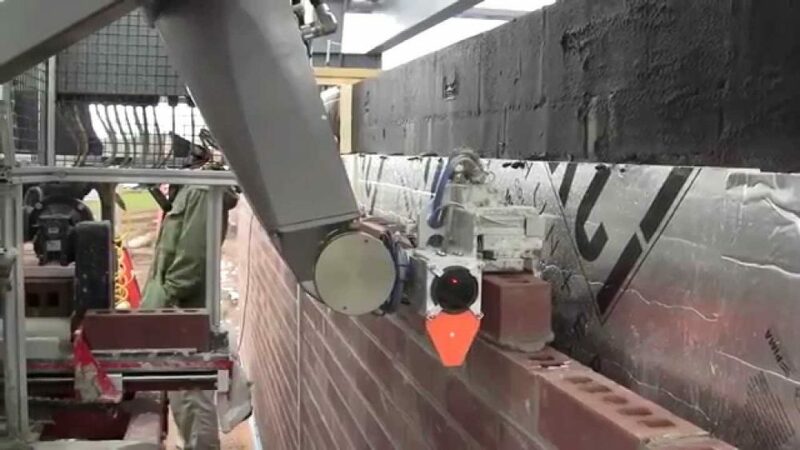 Bricklaying robotics are already being put to use with Construction Robotics SAM100 able to provide 400 per increase in productivity by laying around 2000 bricks per day. Studies show that up to 75 per cent of jobs in the bricklaying sector will be automated – not slashed but altered. Developed by microbiologist Henk Jonkers and concrete specialist Eric Schlangen, the concrete mix uses bacteria as a healing agent to close concrete cracks. It’s embedded with tiny capsules of sodium silicate and when a crack forms the capsules rupture, releasing a gel-like healing agent that hardens to fill the void. Though other researchers have invented similar concrete bacterial combinations, embedding glass capillaries or polymer microcapsules to achieve similar results, Jonkers and Schlangen expect their mix to be the most cost-effective. Developed as part of the Living Architecture (LIAR) project coordinated by Newcastle University, the “digestive” bricks will be able to extract resources from sunlight, waste water and air. “The best way to describe what we’re trying to create is a ‘biomechanical cow’s’ stomach,” says Professor Rachel Armstrong. The bricks will make up a bio-reactive façade that can be easily incorporated in housing, public buildings and office spaces. The ultra-lightweight nanomaterials are currently in the research stage but will eventually have the strength to function as a substitute for steel reinforcement in structures and foundations. Aerogel is a foam-like solid material that holds its shape despite being 99.98 per cent air. It has super-insulating properties, two to four times the insulating power of traditional fiberglass or foam insulation. Still relatively expensive, Aerogel insulation has nevertheless been used in a number of installations in buildings overseas. Architectural Engineer Dr Block’s group is set to make the floors for part of the “HiLo” building called “HiLo”. He’s collaborating with Australian architect, James Gardiner, who developed FreeFab, the first 3D-printing technology to be used in a big commercial building project. The FreeFab wax system prints moulds rather than attempting to print structural material directly, which, though being done on a small scale, still provides problems. FreeFab’s moulds can be melted down and poured back into the tank before being re-extruded into a new form. Traditional moulds, composed of wood and polystyrene, can only be used to produce a single shape and then they are discarded, sent to landfill. There are also 3D printed concrete houses in China as well as a fully functioning office in Dubai. Closer to home, the RMIT Architectural Robotics Lab in Australia is applying robotics to architectural design, building fabrication and construction. It is estimated that 85 per cent of the construction industry use prefabricated processes on projects even though 80 per cent of all construction work is still done on-site. Shifting on-site construction works to off-site prefabrication reduces reliance on labour and provides safer workplaces, minimises the impact on the surrounding neighbourhood and reduces environmental waste during construction. US home-building company KB Home last year unveiled a model “smart” home built entirely in a manufacturing plant. “Automobiles, airplanes and others have been able to utilise these same techniques,” the company’s Senior Vice President for Sustainabillity, Technology and Strategic Source Dan Bridleman observes. Californian merger and acquisitions adviser Digi-Capital expects that of the $108 billion a year which it predicts will be spent by 2021 on augmented reality and virtual reality combined, augmented reality will comprise three-quarters. For the uninitiated, augmented reality supplements the real world by laying computer-generated data over it where virtual reality aims to “drop” users into an artificial real world. Rhode Island construction firm Gilbane Building Company is already using the technology. Gilbane senior manager John Myers, has been testing Microsoft’s AR headset, Hololens, a self-contained, holographic computer which allows Myers to get a closer look. Working off paper blueprints or digital models viewed on an iPad, he has spotted construction issues ahead of time that have saved Gilbane around $5000 in labour costs. The technology has also been adopted by the engineering firm AECOM, architecture firm Gensler and the China State Construction Engineering Corporation.